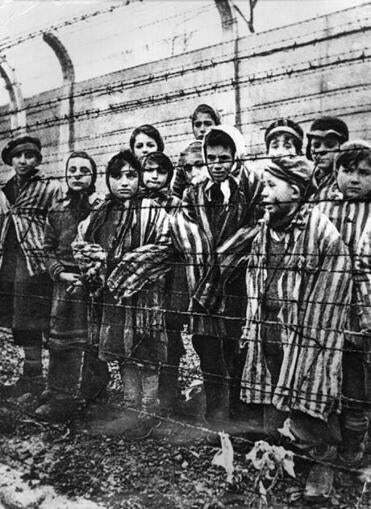 Children stood behind a barbed wire fence at the Nazi concentration camp at Auschwitz in southern Poland in January 1945. This week marks the 70th anniversary of the liberation of Auschwitz by the Red Army. And Thursday is the 83d birthday of my wife’s uncle, Bernie Rosner, who was hurtled into that Nazi death camp’s cruel vortex as a 12-year-old in 1944. Bernie’s ultimate survival and subsequent long and happy life is a lasting triumph over his Nazi tormentors. Bernie’s extraordinary story, like those of nearly every Holocaust survivor, is brutal, dramatic, courageous and, ultimately, life affirming. In June 1944, when he was studying for his bar mitzvah in the provincial Hungarian town of Tab, local authorities and their Nazi allies ordered the deportation of over 475,000 Jews. Given 24 hours notice, Bernie, his younger brother Alexander, and mother and father, Bertha and Louis, were marched with hundreds of other Jews through the streets of Tab on their way to the death camps. Seven decades later, Bernie recalled for Libby and me at his northern California house last weekend that some of his Christian neighbors jeered as he left his home forever. Fearful images of a hot, cloudy day on the Auschwitz train platform are imprinted in Bernie’s memory. Thousands of crying, screaming, terrified people thrown from the train. Nazi guards yelling and pushing them toward a distant checkpoint. His father disappeared first, ordered to report to a different part of the camp. Then his mother, forcibly separated from her two sons. When Bernie tried to follow his younger brother to the line heading left, he was shoved by a German officer to a line to the right. His brother and those in his line were gassed that day while Bernie’s line of men and boys was sent to the Birkenau work camp in the vast, horrible Auschwitz complex. Over the next 10 months, Bernie survived unspeakable cruelties at Auschwitz and three other death camps. Liberated by American troops in May 1945, he and hundreds of other Jewish orphans were spirited into Northern Italy by members of the Jewish Brigade from Palestine. They spent two years there, training to create a new state so Jews would never again be victims. Bernie’s life was changed forever, however, by an American GI who took a liking to this bright, precocious but emotionally-wounded refugee kid. The GI sent a letter offering to bring him to the United States as his ward. Bernie, now 14, chose America over Palestine, because, he reasoned, it was safer to go with the victor. The young GI was Charles Merrill Jr., son of the great Wall Street financier. He gave Bernie a home in which to heal. Excelling at school, Bernie graduated from Cornell and Harvard Law School and eventually became general counsel for Safeway Corp. He survived every deadly trial of the Holocaust but refuses to consider himself a victim. Hitler’s crimes at Auschwitz and other death camps are so enormous that they risk becoming a numbing abstraction unless we recall during this Holocaust Remembrance Week the distinct stories of each victim and each survivor. Bernie’s life, along with those of millions of people caught up in the fires of World War II, demand that we remember and honor the vow — never again.